Candrakīrti (born approx. 600 C.E., Tib. Dawa Drakpa) was abbot of Nalanda University and a disciple of Nāgārjuna and a commentator on his works. Candrakīrti was the most famous member of the Prasaṅgika school of Madhyamaka. 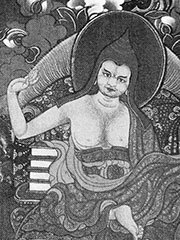 Candrakirti’s writings have formed the basis for Madhyamaka study in all major traditions of Tibetan Buddhism.